A Saint To Watch Over Me. Who Dat! Many times a cliche is over used. That’s not the case in the incredible story of dedication and perseverance that you’re about to read. Tonette Arabie, an employee at Pixus Digital Printing the finest in custom signs and banners, relates to this all too well. Born the second child of four girls, she grew up in a very non-traditional household. There was plenty of love to go around, rules to follow and discipline that’s usually associated with growing up. But, what make this family’s story so unique is that both parents have been deaf since infancy, and her father blind since the age of thirty-five. What makes this story even more incredible is that both her mom and dad were also athletes growing up. Tonette played softball at the age of 5, and not long after began playing basketball at the age of 12 which lasted throughout her high school years. Disappointed from the lack of football leagues for girls, she played with the neighborhood kids, mostly boys, mostly tackle football. On Sundays she and her dad could be found in the family room, commonly participating in the weekly ritual of watching football on television. 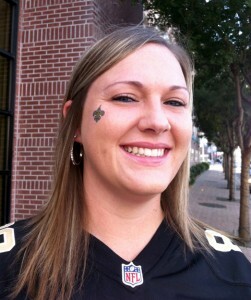 An avid Saints fan her entire life, she became a season ticket holder approximately three years ago. 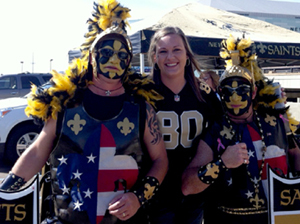 “My favorite player is Jimmy Graham,” she readily admits without hesitation, and each game would be incomplete if it were not for tailgating in Champions Square in New Orleans. A couple of things you probably don’t know about Tonette are – She is fluent with A.S.L. and S.E.E. sign languages. She and her boyfriend recently competed in their very first St. Francisville, La. 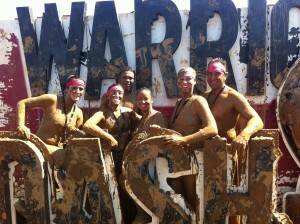 “Warrior Dash,” better known as the Mud Run, a 3 1/2 mile run and swim with 12 obstacles including wall climbs and of course, LOTS of Mud. Pixus Digital Printing is responsible for all content, views and opinions contained within this article.